Welcome visitors to Cornwall yesterday were Will Goodall and his wife Casey, all the way from Australia. Formerly with Intellection, and a regular presenter at MEI Conferences, Will is now Senior Technical Consultant at Bright Phase Pty Ltd and Managing Director & Process mineralogy/metallurgy consultant at MinAssist. He is involved with many things at the moment, including geometallurgical ore characterisation and development of more effective gold deportment characterisation methodologies. 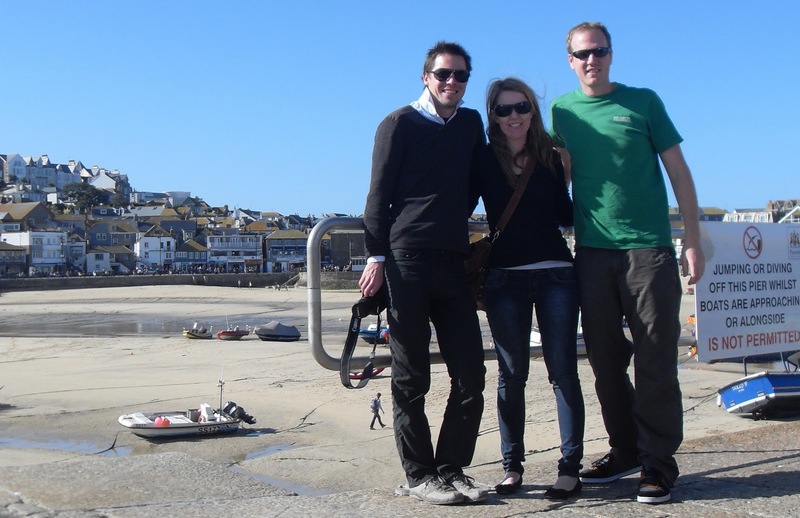 Jon took them on the grand tour, and they are pictured below at St. Ives. A new revolution in comminution? There is interesting news on MEI Online today of two new autogenous mills at Boliden’s Aitik concentrator in Sweden. These 11.6m diameter mills are powered by 22.5 megawatt ABB motors, the most powerful ever built. How big can mills and drives get? Would there be any advantages to going even bigger? I am not a comminution expert, but I would really like the views of those who are. In my posting of 4th May I sensed a new revolution in comminution technology, which I also remarked upon in my summing up at Comminution ’10. There is certainly a lot going on in comminution at the moment and this is reflected in the flying start to Comminution ’12, which will be held in Cape Town in April 2012. Already major sponsors Starkey & Associates Inc., Magotteaux, JKTech and Maelgwyn Mineral Services are on board, with many more expressing interest. 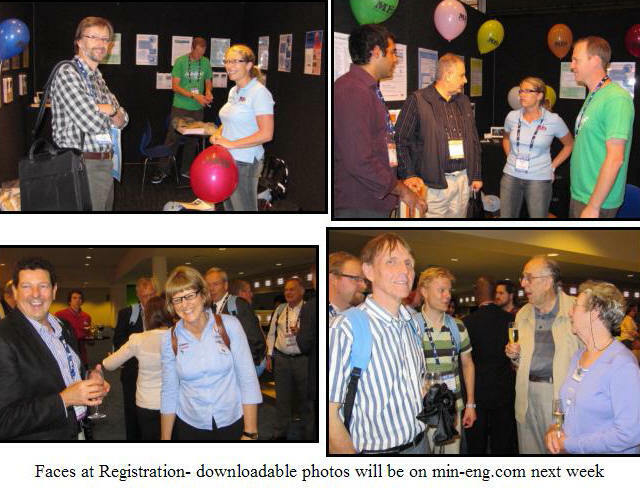 Papers presented at the conference will feed into a special issue of Minerals Engineering. The special issue of Comminution '10 is scheduled for Volume 24 Numbers 3-4 in March 2011 and will contain some outstanding state-of-the-art papers. Steve Williams of GeoMet Tech, Canada, writes on Twitter ‘should metallurgy courses have more geology and mineralogy’. I’m not quite sure what he means by more, but surely all mineral processing departments now know the value of mineralogy? But what about geometallurgy, a relatively new word in the mineral processing lexicon? Is this working its way into mineral processing syllabuses? Geometallurgy is the science of integrating geology and mineralogy with mineral processing and extraction. Although not really a new discipline, the new name has focused attention on its importance and next year the AusIMM will run the first international conference on geometallurgy in Brisbane. In November of this year Steve will be presenting a paper The emerging study of geometallurgy – what is it and where might it go?, one of a number of geometallurgy papers scheduled at Process Mineralogy ’10 in Cape Town. There has been a frenzy of activity on LinkedIn since the recent IMPC. 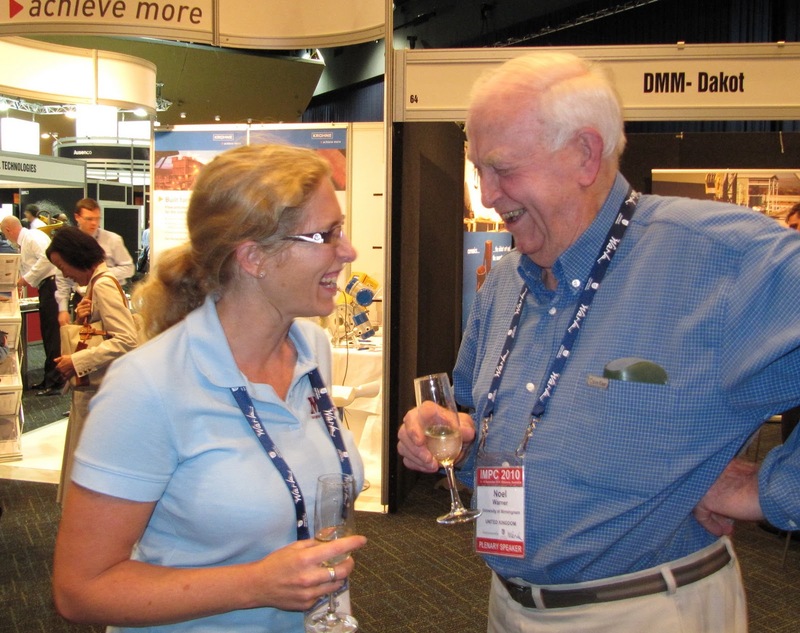 Many more mineral processors have joined since the Brisbane event, and I notice a great deal of activity in increasing personal connections. The Minerals Engineers group continues to grow, and today reached 600 members, and a number of new groups have been formed, such as Comminution, and company groups, such as Gekko Systems, JKTech and Maelgwyn Minerals. From the general chatter at the IMPC it is apparent that LinkedIn has now taken off in a big way, so if you are not already subscribed, I advise you to consider it. The purpose of this blog posting is to explain to prospective Minerals Engineering journal authors why I am particularly fastidious about the quality of English in submitted papers. Peer-reviewed journals such as Minerals Engineering require not only high standards of science in their papers, but also high quality technical English, as poor English often creates ambiguities, which may not be apparent to those with English as their first language. Technical English is basically simplified English, designed to reduce ambiguities and to increase comprehension for those whose first language is not English. Good technical English should use short sentences and paragraphs and must avoid slang and colloquialisms. It should present material in an easy and clear way. There are many pitfalls, however. English is an immensely complex language and many very similar words have very different meanings. Even among first language English speakers there is often confusion regarding the noun ‘effect’ and the verb ‘affect’ and even reputable newspapers often mistakenly use the noun ‘dependant’ in phrases such as ‘...is dependent on...’. Even more confusing to non-English speaking authors is that many words sound the same but have very different meanings, such that reliance totally on automatic spell-checkers is never an ideal option. Take the simple sentence “Could you be here in four days?” for instance. This makes sense and passes the spell-checker, but so does “Cud ewe bee hear inn fore daze” which sounds the same, but makes no sense at all. One of the most overlooked aspects of good technical English, but one which often causes the greatest degree of ambiguity, is punctuation. There is a trend in literature to dispense with punctuation, but this must be avoided with technical English, as what appears to be obvious to an English speaker may not be so to one who does not have English as his/her mother tongue. For instance the sign, seen on many of our local beaches ‘No dogs please’ is implicitly understood – it is a request to keep your dogs off the beach. In fact it is a statement that all dogs are disagreeable, ‘please’ in this case being a verb! The addition of a comma, ‘No dogs, please’ totally changes the meaning into the familiar request. There are many examples in the book of ambiguities caused by poor punctuation. The comma is often a culprit, but so is the apostrophe, one of the most misused punctuation marks in the language. “Residents’ refuse to be put in bins”, meaning that the rubbish produced by residents is to be disposed of in bins, takes on a completely different meaning if the apostrophe is omitted, refuse becoming a verb rather than an noun, and the sentence stating that the residents are refusing to be put in bins! So, what I am basically saying is that if I ask you to improve the English in your paper, I am not just being pedantic. There is a real reason for this and I ask all non-English speaking authors to seek the advice of a colleague or contact, whose first language is English, who may be able to assist in editing the paper before submission. There is news today of the new joint venture company formed between JKTech and InfoMine, another chapter in the continuing success story of the JKMRC and its offshoot the JKTech. The Julius Kruttschnitt Mineral Research Centre (JKMRC) grew from an initial research team formed in the 1960s. It was officially established as a University Centre of The University of Queensland in 1970, with a goal to develop practical technical solutions for large-scale mining and minerals industry challenges. Its first Director was Prof. Alban Lynch, one of this year’s recipients of the Lifetime Achievement Award of the IMPC. In 1986, JKTech was established to take viable JKMRC research outcomes and deliver technology and solutions to the international minerals industry. In 2001 JKTech Pty Ltd was incorporated and the company now provides a range of innovative solutions aimed at increasing productivity and metal recovery. These specialist products and services include consulting, software, equipment, laboratory services and knowledge transfer. 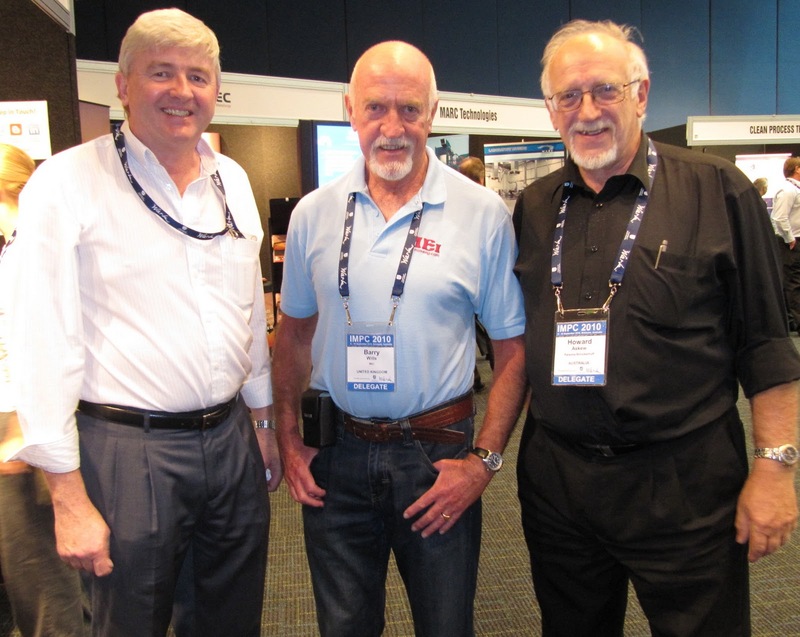 JKMRC and JKTech have a very strong presence at all major mineral processing conferences, including the recent IMPC in Brisbane. 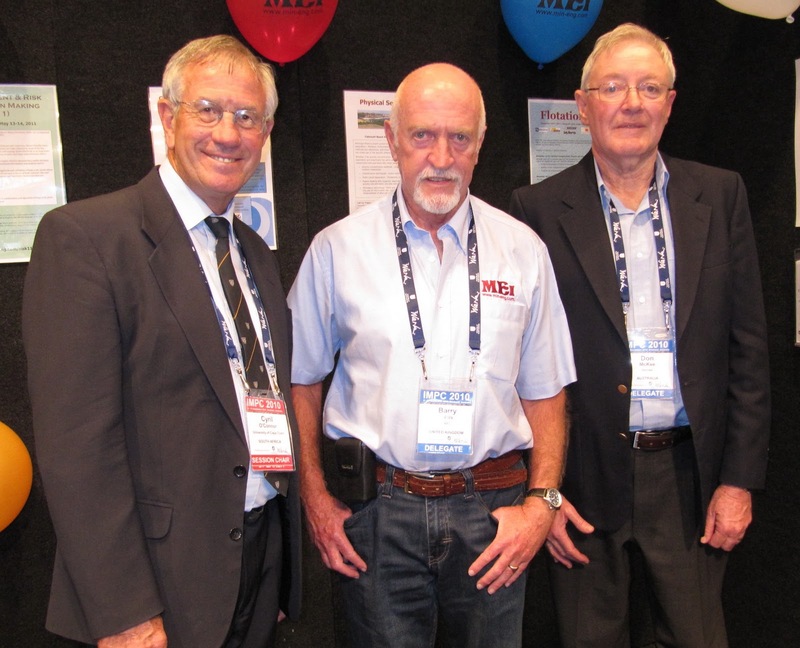 The picture below shows the strong contingent at the Mill Operators’ Conference in 2009. Second from the right is Tim Napier-Munn, the 3rd Director of JKMRC. Sara, we thank you for this, which is most appreciated, and we are also proud of our long and continuing association with the JK. 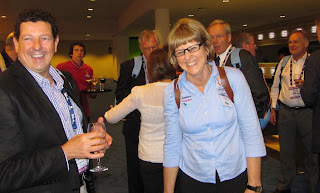 Last week’s IMPC in Brisbane was one of the best, and the organising committee of the AusIMM, CSIRO and JKTech must be congratulated on a thoroughly professionally organised event. As a media sponsor, I would like to pay special tribute on behalf of MEI to Alison McKenzie and Miriam Way our contacts at the AusIMM, who have been a pleasure to work with as always. What makes a great IMPC? Well obviously the papers are important, and there were well over 400 of these in plenary, keynote, parallel and poster sessions. It would be impossible for me to comment on all these, not only because of their numbers, but also, and I apologise to all authors for this, because I did not attend any of them! I was too busy talking to people. A well-known academic asked me why I enjoyed attending conferences- surely I must be fed up with them by now? When I tire of meeting new people and catching up with old friends and colleagues, then I will tire of conferences, but the end is not yet in sight. The great attraction of an IMPC such as that in Brisbane is that it is an opportunity to get together for 4 days with what is essentially the whole world of mineral processing, and why Brisbane, Beijing, Istanbul and others were so successful is that the infrastructure and social activities encouraged interaction in relaxed and informal atmospheres. Of major importance is centring the coffee and lunch breaks, welcoming functions, happy hours etc on the exhibition. Amanda, Jon and I were busy all day in our exhibit booth, talking to the many people who called in for a chat, and we had many pleasant encounters with surprise visitors, such as my meeting with ex-Camborne School of Mines students Martin Moloney and Howard Askew, who were among the first mineral processing graduates from CSM in 1979. Although I have bumped into Martin in the past, this was my first meeting with Howard in 31 years. Amanda also had a pleasant surprise when Noel Warner, Emeritus Professor at the University of Birmingham, called in to see us. Noel I have known for years, and he was once external examiner for CSM but Amanda and Noel had not seen each other for 13 years, since Amanda left Birmingham with her PhD in Chemical Engineering. It is obvious from the photo that they enjoyed their reunion, and that they weren’t discussing Noel’s plenary lecture on geosequestration! Nor is Dee Bradshaw of JKMRC looking particularly dismayed at catching up with her old University of Cape Town colleague Jan Cilliers, now with Imperial College, UK. Another obviously joyful reunion was between Tim-Napier Munn who was a lecturer at Imperial College from 1977-1980, and some of the 1982 graduates in Mineral Technology at the RSM: left to right John Marsden, Richard Williams, Cathy Evans and Tim. At the conference dinner, many of Graeme Jameson’s current and past University of Newcastle (Australia) students got together for a reunion photo. There must have been many such reunions at the conference, and this is what makes events such as this so special, so no, I will not be opting out of this enjoyable aspect of life just yet. Although Brisbane could not compete with Beijing and Istanbul historically and culturally, the social events, particularly the Gala Dinner, were special events. This was my 9th visit to Brisbane, and it is has changed radically in recent years, with inordinate growth and development. When I first visited in 1983 it was no more than a sleepy town, but it is now Australia’s second major city, and growth is continuous. The photos below were taken in St. George’s Square in 1983 and last week. 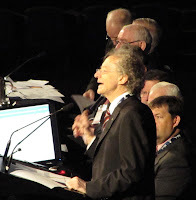 So thanks again Australia, you did the mineral processing community proud, and I hope that the standard of IMPCs in recent times can be maintained at New Delhi 2012, Santiago 2014 and Quebec City 2014. Well over 1000 people attended tonight’s Silver Jubilee Congress Dinner, held in the Convention Centre Ballroom. Sponsored by Sinclair Knight Merz, this was a lavish and enjoyable event, with entertainment by Australian comedians ‘The Three Waiters’. The highlight of the evening was the presentation of the IMPC Awards. The IMPC Council Award was made to Prof. Jacques Astier. The first in this series, for outstanding and noteworthy contributions to the activities of the Council and its various activities, was awarded to the late Prof. Nat Arbiter at the last IMPC in Beijing. The most prestigious award in mineral processing is the IMPC Lifetime Achievement Award and for the first time in its history, this was awarded to two recipients, Prof. Alban Lynch and Prof. Wang Dianzou. There will be a full report on this in MEI Online next week. In the photo below are Robin Batterham (IMPC 2010 President), Cyril O’Connor (IMPC Chairman), Prof. Dianzuo, Prof. Lynch, and Eric Forssberg (past IMPC Chairman). In the photo below are the winners of the Young Author’s Award, for best presentations by authors under 35 years old. I was personally pleased to see among the award winners Dr. Megan Becker of University of Cape Town, our consultant for Process Mineralogy ’10, and Dr. Kathryn Hadler, of Imperial College, who is also MEI Jon’s girlfriend. MEI has been represented at IMPCs since the Stockholm meeting in the late 80s and in recent years these events have developed into major networking opportunities, where academics, researchers, operators and equipment manufacturers are brought together. A particularly attractive aspect, which we also feature in MEI Conferences, is that coffee and lunch breaks are held in the exhibition area, so that networking is encouraged. There has been quite a bit of concern expressed among current exhibitors that the exhibition area in New Delhi in 2012 will be 4km from the congress and that the ethos of the IMPC may be compromised. The themes of the exhibition are also worrying, including casting machines, drilling equipment, earthmoving equipment, explosives and many other non-mineral processing topics. On behalf of the exhibitors I expressed my concern to the organising committee, and they are certainly prepared to listen. I hope to report back on any changes that are made to the current plans, which appear in the brochure available at this IMPC. I have also asked the organisers to respond to this posting, and invite comments from all potential exhibitors and delegates. Can undergraduate numbers sustain the mineral processing workforce? This morning the IMP Advisory Committee meeting was open to all delegates. The committee is represented by 34 countries, and at the Istanbul IMP three commissions were set up, Robin Batterham chairing the commission on mineral processing, to basically define its ever changing boundaries, which aid definition of the themes of the IMPCs. In Delhi in 2012 the theme will be ‘Innovative Processes for Sustainable Growth’. Roberto Villas-Boas is the chair of sustainability examining various aspects, such as energy reduction and environmental impact. North America 175, hardly enough to maintain sustainability within that area. Australia 40, a very disappointing number, such that Australia is now recruiting chemical engineers as mineral processors to service its large industry (note that a large proportion of job vacancies on MEI Online are in Australia). Eastern Europe 600, about two-thirds of these are from Turkey’s many mineral processing departments. China an amazing 3000; of the total 5500 graduates per year, nearly 60% are from China. Of the total graduates, around 70% go into industry, and on average only about 20% are female. It is predicted that there will be a 15% growth in numbers by 2015. The AusIMM took the opportunity today to launch what may become a seminal work on flotation. History of Flotation covers the developments in flotation from its earliest days in Australia to the present time, dealing not only with the technology, but the people who aided its development. 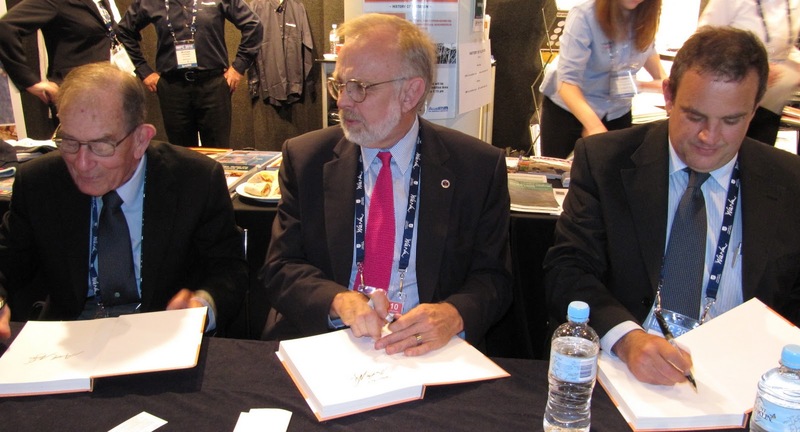 The three authors, Alban Lynch, Mike Nelson and Greg Harbort signed copies of the book, which is available from www.ausimm.com/shop. There is no hard printed Proceedings volume, a trend that I hope will continue with future IMPCs. Instead there is a handy slim volume of abstracts to accompany the Proceedings CD. This is also available for purchase from the AusIMM. Good to see that virtually everyone I speak to is aware that MEI Online is the world’s largest source of mineral processing news and information, but not everyone is aware that we publish news items free of charge, so if you have any news that you would like to share with the mineral processing community, please send your press releases to us. Internet access in the convention centre is very slow, so it is a little difficult to add high resolution photos to the blog. We continue to take pictures of people at the IMPC, and all photos will be published on MEI Online next week, and will be available for download. When available an alert will be made on Twitter. If you do not follow me on Twitter, that is no problem, as my recent tweets (I hate that word!) can be seen in the right hand column of the blog. Although the MEI booth is rather remotely located in the exhibition area, we have a regular stream of visitors who call in for a chat. It’s amazing how many names I have recognised but cannot put faces to them. They turn out to be LinkedIn connections, and it is evident that this powerful networking tool is really taking off with professionals, so if you are not subscribed, I urge you to do so, and I also invite you to connect with me. Andy Stradling of Tech Cominco, Canada, an ex-student of mine at Camborne School of Mines, who I recruited into the minerals industry during a talk at his school in the early 80s. Dean Eastbury of Elsevier has spent much time at our booth. He is publishing manager for Minerals Engineering, International Journal of Mineral Processing and Hydrometallurgy. and I have been able to introduce him to several members of the Minerals Engineering editorial board, including Mike Adams of Mutis Liber, Dave Deglon of University of Cape Town, Jannie van Deventer of University of Melbourne, Richard Williams of University of Leeds, Brian Loveday of University of KwaZulu-Natal and members of the review panel. A number of people have spoken highly of the keynote presentation yesterday by Robert Schouwstra of Anglo Research, South Africa. I unfortunately missed this due to another commitment. Robert is also a keynote speaker in November at Process Mineralogy ’10. Yesterday he reviewed the progress on the development of automated mineralogical techniques for fast, automated mineral measurements. A very early start this morning for the IMPC Opening Ceremony. 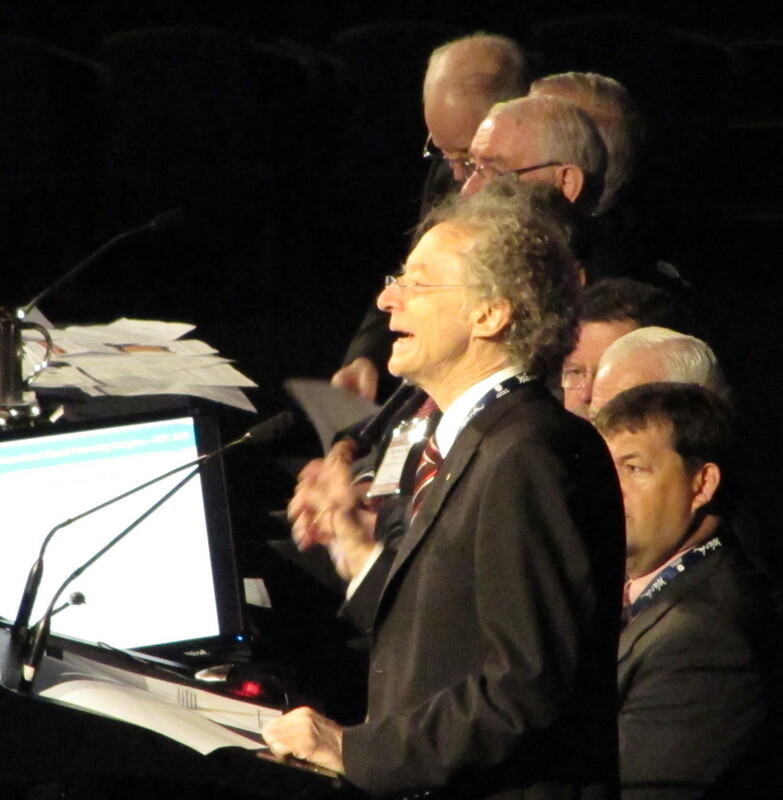 Within the formal speeches, Robin Batterham, the IMPC 2010 President, highlighted that one of the hallmarks of the IMPCs is the opportunity given to young researchers to meet with famous and eminent figures from the world of mineral processing. Over 1100 delegates have registered for the event, and over 400 papers are contained in the Proceedings CD. During the relatively short coffee and lunch breaks, delegates had the opportunity of visiting the 58 exhibition booths. The MEI booth had many interesting visitors, including Don McKee, who I have not seen for many years. Don was for many years Director of Australia's JKMRC, and he is the longest serving member of the Minerals Engineering editorial board. In the photo on the left I am photographed with Don (right) and Cyril O'Connor, now Chairman of the IMPC. At the inception of the journal in 1988, Don was regional editor, Australia, and Cyril regional editor Africa. Amanda and I arrived in Brisbane early yesterday morning after a 23 hour journey from Heathrow via Singapore. We caught up with Alex Jankovic of Metso in Singapore, and there were a few familiar faces at our hotel, the Ibis. The IMPC coincides with the Brisbane Festival, so hotel and restaurant prices are higher than normal, particularly last night, when the spectacular firework display, the Riverfire, was held, centred on Story Bridge. We met up with Jon, and Kathryn Hadler, who had flown in via Hong Kong, and Stephen Neethling of Imperial College, and joined the crowds to view this by the Eagle Street Pier. Conference registration began this afternoon and was very smoothly operated by the AusIMM staff. The exhibitors also set up in the afternoon, and a few of the 1000+ delegates got together for complimentary drinks in the registration area. There is a definite buzz about this IMPC so we are looking forward to the next few days and there will be photos and news on the blog each day. Jon, Amanda and I leave Cornwall today for the long trip to Brisbane, for the world's number 1 mineral processing event the XXV International Mineral Processing Congress (IMPC). If you are there, call in and see us at the MEI Booth (#23). If you cannot be there, catch up with regular updates on the proceedings via Twitter, and daily news and photos on the MEI blog (you can be alerted to new blog postings by adding your email address to the box in the right-hand column). The highlight of the event will be the announcement of the recipient of the IMPC Lifetime Achievement Award. As soon as the award is made at the gala dinner, you will be notified of the winner on Twitter, and photos will be on the blog the following day. All photos taken at the event will be available for download on MEI Online in the week following the congress- again watch out for the announcement on Twitter. We look forward to meeting as many of you as possible in Brisbane. Is the Bond Work Index still relevant? Is minerals engineering the most important branch of technology?